Diamond is a native Washingtonian, but was raised in Prince George’s County, Maryland. Currently, she is completing her Master’s in Mental Health Counseling. She earned her Bachelor of Science in Marketing from the University of Maryland at College Park and a second bachelor’s degree in Psychology from Bowie State University. Additionally, she is a graduate assistant in the Department of Counseling in the College of Education, the Vice President of the Association of Christian Leadership, and member of the Student Adlerian Society, Chi Sigma Iota Honor Society, Golden Key Honor Society, and the African Psychology Student Association. She brings over five years of student government experience as both an undergraduate and a graduate student, including serving as the 2017-2018 Vice President of Graduate Affairs for the University System of Maryland Student Council. Prior to returning to school full time, Diamond operated her multi-million-dollar business and has over fifteen years of experience in leadership and marketing in public, non-profit, and corporate institutions. For her, no student, program, or institution is an island. Thus, she remains committed to the work of representing graduate voices to the administration, to other shared governance constituents, and even with each other. Her vision includes growing Graduate Student Appreciation Week, instituting a graduate student of the month spotlight, and hosting a series of professional development workshops where industry and community experts to engage with the graduate students. Every program she proposes is designed to improves the corporate status of all graduates and increase the value of a Bowie State University graduate degree. Representing the graduate student voice and needs allows her to give back and ensure that her financial investment as a graduate student is and has been maximized. Resting on the foundations of past administrations she is honored to work with and for the graduate student body so that GSA leads the charge in encouraging the BSU community to streamline processes and increase the number graduate student scholarships and financing. Donovan Blake was born and raised in New Orleans, Louisiana. She earned her BS in Biology from Howard University. After graduating, she began to give back by teaching at Banneker High School; which is directly across the street from the University. She went on to George Washington to obtain her Master's degree in Transition Special Education. Donovan is currently earning her Doctorate in Educational Leadership at Bowie State University. Donovan is a wife and mother. She works with her daughters as community advocates for disabilities. Donovan has been working in the public school system for over 15 years. Her vast experience includes supervising the Special Education department at an urban high school. In 2014 the Montgomery County PTA awarded her as Special Educator of the year. Donovan is the three time recipient of the Washington Post Grants in Education and several Adopt-a-Classroom grants. 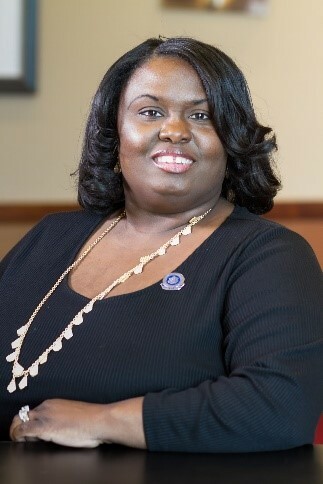 She is a member of the National Education Association, Howard University Alumni Club of Prince George's County (Past President), Girl Scout Troop Leader, member of Reid Temple AME Church, the 2016-2017 White House Initiative on HBCUs All-Star for Bowie State University. Carl C. Scott is a Bronx native whose goal in life is to travel the world and help adolescents overcome any obstacle. He has lived in Pennsylvania, Ohio, Georgia, and now he is a Maryland resident. Carl was the first person in his family to attend and Graduate from college. Carl Graduated from the illustrious school by the sea, Savannah State University in 2013 with a Bachelors degree in Behavior Analysis and Sociology. Carl has a passion for working with under privileged youth, and writing. Carl is a man with principles. Carl believes that helping and serving the community is an obligation. Carl started the BOSS-mentoring program for Males in 4th and 5th grade. BOSS stands for Brothers Overcoming Struggles for Success. He also served as the 2017-2018 Executive Assistant for the Student Adlerian Association (SAS) at Bowie State University. Carl’s vision for Executive Vice President of the Graduate Student Association is to increase the visibility of graduate students on campus. He hopes to bring more organizations and employers on campus to increase employment, professional development, and networking opportunities for graduate students. Carl also wants to connect GSA with the Student Government Association (SGA) and other undergraduate organizations at Bowie State University. After graduation, Carl will be pursuing his doctoral degree in Developmental Psychology or Counseling Psychology in hopes of retuning to Bowie State University and educating future counselors. Carl emphasizes the importance of teamwork. He lives by the quote "If one person can eat, so can two. And if two people can eat, so can four." Sharing and influencing are two of his strengths just to name a few. Kyndall Peele is an avid scholar who comes to Bowie State by way of Cleveland, Ohio. She is currently researching and presenting Adlerian techniques that can be used with Millennials. She aspires to become a Global Clinical Psychologist who will work with war refugees and those with traumatic brain injuries. She enjoys swimming, traveling, and reading. Shanice Martin was born and raised in Brooklyn, New York. She has obtained her Bachelor’s degree in psychology from the SUNY, University at Albany. Currently, she is pursing a Master’s degree in Mental Health Counseling. After completing her degree, Shanice plans on pursing a PhD in counseling psychology. Shanice’s areas of interests are sports and performance counseling and as a Caribbean descent, hopes to spread counseling in the Caribbeans. She currently is a member of Golden Key Honor Society, National Society of Leadership and Success and Chi Sigma Iota Honor Society. Shanice was formally the treasurer for the Student Adlerian Society during the 2017-2018 academic year, and has over four years of executive board member experience from various organizations during her undergraduate and graduate career. As a member of Alpha Kappa Alpha Sorority, Incorporated, Shanice has always had the desire to maintain a progressive interest in college life, and to be of “Service to All Mankind.” She wants to ensure Graduate Students are getting the most out of their time at Bowie State University. Jamelia Hampton-Dugger is a social engineer, strategist and 21st Century leader who partners nationally and internationally with CEOs, executives, providers, churches, and leaders to address issues plaguing communities abroad. Jamelia has spent over a decade working in the social service field with residential camps, after school programs, leadership institutes, intensive in-home counseling services and the chronically homeless in Washington,DC. Upon graduation she will go to medical school to learn the art healing. She is the current President and Chaplain of the Association of Christians in Leadership. She serves as Chancellor of Blue Ridge Christian Leadership Center and has been licensed as an Elder since 2011. Jamelia holds a BS in Psychology from Bowie State University and graduates next May with a MA in Counseling Psychology.